Would you read a post whose only picture is of a whole in the ground? I’ve been wandering around my house with a dead digital camera in my hands, wondering where I might find a set of batteries in the middle of all this mess. Because there’s this one picture that I want to take. I keep turning on my camera just to check that maybe, the batteries will miraculously revive themselves and give me one more open and shut of the shutter. No luck. And I realized this afternoon that I’ve been walking around looking for batteries for the last two days. But she’s coming to visit at the end of the week, and she and I have a date for IKEA, so I will get my act together, tomorrow…….. Seriously, though. It’s not that bad. At least I don’t think so. I feel like we brought our beds over to the new house, put sheets on, stuffed three shirts and a pair of underwear in the dresser, unpacked one box of plates and cereal bowls and then life got busy. The first week we were in the house my mother-in-law was here. A great help, but still not “normal” life. The second (and third?) week was marred by repairmen, electrical issues, opening up a farm account to get a propane tank to run my stove, and kicker of all kickers–septic issues. Some Sunday night since we moved in, which is now a blur, Dan and I woke to strange sounds coming from the downstairs toilet. Which turned out to be overflowing streams of water running into the dining room. So the next two days–no toilets, no washing machine, no doing dishes (THAT I can handle). My girls would whine, “But mom I neeed to go the bathroom!” And we’d all pile in the car in a flurry of full bladders and show up at my Dad’s house, running cross-legged to the restroom. And then it was fixed. And then it broke. Again. When people ask me, “how’s life in the new house?” I have the feeling I’m giving them this glazed over smile and blabbering something about “a few hiccups, but we still love it.” Big smile. So yes, there have been a few hiccups. But really, it’s like we’re waking up a sleeping house. Giving it new life. And there are a few sore muscles in the old girl. And I confess to a few meltdowns. A night of sitting on the edge of the tub, in a bathroom with no electricity, crying to my husband. But then laughing through those tears in the very same minute. And I’m still laughing now. Now that I *think* we’re on the other side of some of these hiccups. (At least for this week.) Though I get a little weak in the knees when I see all the boxes and bags and stuff. I’m somehow finding a way to work very hard all day and yet it seems that not a single box has been emptied. But my sister is here this week, with her kids. And it’s a nice relief. Even though I still haven’t unpacked a box. Or gone to the grocery store. But we did go to IKEA this morning and I bought a little runner for the bottom of the steps. And that makes me happy. And I swept my kitchen floor this morning and there’s a little pile in the corner big enough to well….clog a septic system. Not that I’d want to. So bear with me as I get back in the swing of things and laugh with me, please, as I recount the early days in the new house. I will move on to other topics, I promise. I have a bit of news to share. And, as if I didn’t have enough to do, I’m dreaming up a little swap. A very simple, easy swap. I’m not that crazy. Stay tuned. More adventures are around the corner, I’m sure. So glad to see you’re back! 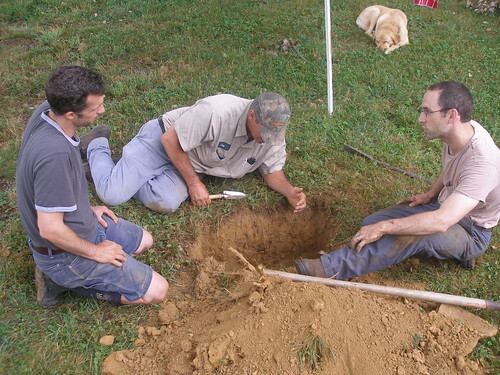 So sorry to hear of your septic problems….I have some serious septic stories for you. I have been so thankful over the last 7 or 8 years for our membership at the YMCA and their blessed fitness center complete with bathrooms and showers. Amen to the 5 gallon bucket…did you know human urine is good for your compost (not #2 though)? Keep looking up and accept any and all help that is offered! We’re planning on Friday. Counting the hours actually. I’ve been wondering what you’re up to!I wish you were closer to DC, ’cause I’ll be there in a month! hi molly! i wish i could come and help you unpack and move in. its more fun when its not your own stuff to unpack. kind of like how its easier to clean someone’s house? we had overflowing toilet syndrome when we moved in to our duplex last year. it kept overflowing and flooding the whole floor. But luckily for us, we rent, so someone else had to fix it… hang in there! oh honey! if i could be there tomorrow, i would. some day…. it does sound like quite the adventure, though. one of these days you are going to look back on this time and not remember all the craziness, just some of it. enjoy your sister’s visit – say hi to jennifer and emily for me. i’d have met you there this morning! next week. i love to hear the tales of the settling in. and glad to know that some things are working themselves out. the boxes, they’ll wait, won’t they? wake the girl (house) gently and she’ll rise and shine – just like with a child, i suspect. enjoy your sister. and see you soon! and ps. if you want to come to ikea in your sweats, it’s fine with me! Oh, unpacking drives me crazy. We moved a lot when I was a kid, and I would never sleep until my room was all put together. So I usually ended up pulling an all nighter our first night in the house. I hope all the other issues calm down so you can just settle. Geez, craziness going on. Hang in there, it will all smooth out before you know it! Oh wow Molly, it doesn’t sound ideal, but it does sound like the kind of stuff you will look back on and laugh about in a few years…hang in there and enjoy your visit with your sister and those blog-buddies! Oh dear it sounds like your life had been full of surprises! I hope you enjoyed the cucumbers. There are plenty more where they came from. hiccups…remain calm they will pass with time :0) … i can just picture you with your 3 little gals running cross legged !! i hope things heal up really soon! Take deep breaths and pray. And giggle like you’re already doing! Oh, I feel for you. This will pass as well and just become a humorous story to pass on. Oh, and by the way, I love reading your posts even with the hole in the ground picture. 🙂 Looks like they’re having a philosophical discussion about the hole rather than doing something with it! Molly I think we are sister in the remodeling department. All I have to say is 5 gallon bucket. And some Home Improvement stores carry toliet lids that go on them. Not pleasant but when you got to go, you got to go.I’ve been on a swapping urge go can’t wait to what you have in store. oh molly! Hang in there, girl. I love how you compare your house to an old girl waking up… that is exactly what is happening. And I’m seriously jealous you have an ikea. Oh yes…the adventures of home ownership. Sorry things have been less than smooth. But at this point, I think you have the right idea…its the little things. A new rug here, a vase of flowers there. Hope things level out soon for you. I’ve missed your posts. I hope your luck turns and that things start to run more smoothly. Well, it has been a bit of a rollercoaster, but you will get there. As for the boxes, as long as it’s not depressing you, let it go. It will happen. I wish we could get together a big team of your readers to come and help you. My mum used to work for a removal company as an “angel” where they would unpack everything for you and have your first meal ready for you, make all the beds etc. I always wished I had someone like that around to help when I moved. Looking forward to your swap announcement. Oh Molly, hang in there. To be honest, it all sounds very exciting to me. Even with the hiccups, a new house to make your own. Just remember it will take time to get it to where you want it to be. And that is perfectly ok.